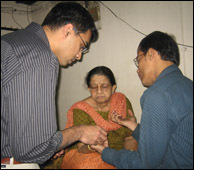 During the month of January of 2009, I had the singular opportunity to visit a rehabilitation clinic in Kolkata, India. Before I go any further, I would like to introduce Kolkata as a city on the eastern part of India. This is one of 4 metropolitan cities of India and the ex administrative capital of the Indian subcontinent (a term used to geographically describe India, Pakistan and Bangladesh during the British Rule- pre1947). Kolkata is a vibrant city of about 16 million people, within an area that is about half that of NYC. The diversity of people in the city has no limits, with a unique mix ranging from Chinese ancestry to Caucasians (albeit rare). The diversity does not end there but extends to religions as well, and includes all major religions of the world (Hindus, Muslims, Christians, Jews, Zoroastrians, Sikhs, Buddhists and many more). Running an outpatient clinic in a relatively new field such as rehabilitation medicine amongst a diverse population presents with a unique set of challenges. The concept of rehabilitation is not very popular in India yet. Many people - even doctors and medical practitioners - don't appreciate the concept of total rehabilitation after surgery or even instead of surgery. While a few government sponsored institutions are doing work on a small scale it is a challenge to change established thinking towards non surgical care with modalities like targeted physical therapy, accu-pressure, trigger point injections, speech therapy, orthotics, and occupational therapy. As a resident it was a particularly rewarding experience for me to visit and be apart of a setting as unique as this and taking care of patients in an environment that was very different from our usual setting. Although the approach to the patient is very similar to western medicine, the treatment of the patient seemed more holistic as I found myself dealing a lot with the patient's familial situation and often in more of a counseling role. The physician is seen as a person of higher wisdom in that part of the world and hence is treated with great respect. This comes with great responsibility, both moral and ethical. The challenge is to be able to handle this responsibility and culture while almost 'forcing' some amount of decision making by the patients themselves so that they have some control over their recovery process. My role as a medical resident was not too different than here although the setting, the diverse population and the pathologies is what made it singular. My discussions with the attending, the grand rounds with the multidisciplinary teams and interacting with patient from very poor backgrounds made the experience so much more fulfilling.